Ernest Doe have been professional groundcare machinery distributors since the 1960s. Our relationship with Ransomes goes back much further, but our role as professional groundcare machinery dealer grew considerably during the last part of the 20th century and continues now well into the 21st. We are groundcare machinery distributors for a number of top brands including Ransomes Jacobsen, Iseki and New Holland. As professional groundcare machinery dealers, we support all the machines we sell through servicing and repairs in well-equipped workshops and through a professional, comprehensive parts supply service. Ernest Doe is the largest groundcare machinery distributors for Ransomes Jacobsen in the UK. We stock turf care machinery for municipal, amenity, golf and sports ground use including mowers, specialist attachments and utility vehicles. Ransomes, from their manufacturing base in Ipswich, have built a fine reputation for innovation and reliability in grass cutting machinery for amenity and municipal applications. 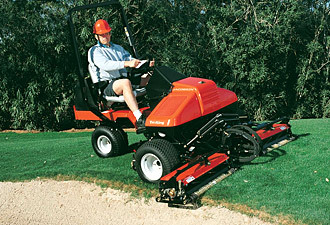 Jacobsen has an unrivalled reputation for quality of finish in sports and golf arenas. 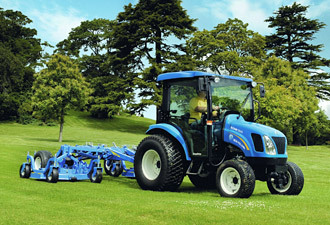 We supply the Iseki SXG range of compact tractors and ride on mowers up to 75 horsepower. These are rugged and highly versatile machines which can easily be used for a wide range of groundcare tasks via a range of attachments for mowing, harrowing, seeding and feeding. As well as getting the job done quickly, these vehicles are designed to be gentle on your turf, with wide tyres that spread the load evenly, as well as making them suitable for uneven or steep terrain. As the largest UK supplier of New Holland tractors we can supply compact tractors suitable for sports and local authority use. In an ever changing world, it is reassuring to know that you can trust New Holland to offer well-proven, compact tractors. They combine rugged strength, low operating costs and just the features you need to get the job done. 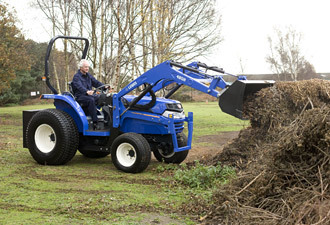 New Holland compact tractors offer a no-nonsense answer to increasingly complex demands. New Holland groundcare machinery features a wide range of attachments such as backhoe, plough, harrow, trailers, motivators, brushes, paddock cleaners and fertiliser spreaders, making these exceptionally versatile machines. Available in a range of sizes and power capability from 18hp to 50hp, all New Holland compact tractors are 4 wheel drive with a tight turning circle for use on uneven and awkward terrain. 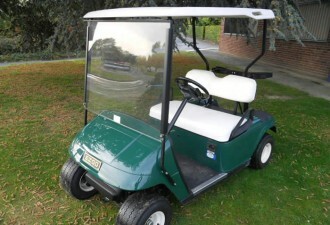 We sell E-Z-GO golf carts and specialist vehicles. E-Z-GO has grown into a global leader in light transportation, building many thousands of vehicles each year from its headquarters in Augusta. Besides the golf cars with which it is so often identified, E-Z-GO also manufactures world-class utility vehicles for work and recreation, personnel shuttles and material-handling machines. Groundcare machinery is available at Ernest Doe branches in Suffolk, Norfolk, Essex, Cambridgeshire, Hertfordshire, Kent, East Sussex, West Sussex and Surrey. Groundcare implements for compact tractors & groundcare maintenance. Visit our golf cart mini-site.